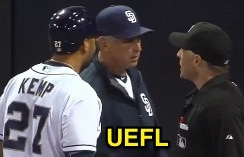 HP Umpire Dan Iassogna ejected Padres RF Matt Kemp and Manager Bud Black for arguing a strike one call in the bottom of the 8th inning of the Mets-Padres game. With none out and none on, Kemp took a 2-0 fastball from Mets pitcher Jacob deGrom for a called first strike. Replays indicate the pitch was located over the outer edge of home plate and thigh-high (px .811, pz 1.926 [sz_bot 1.710]), the call was correct. At the time of the ejections, the Mets were leading, 7-0. The Mets ultimately won the contest, 7-0. These are Dan Iassogna (58)'s first and second ejections of 2015. Dan Iassogna now has 10 points in the UEFL Standings (2 Previous + 2*[2 MLB + 2 Correct] = 10). Crew Chief Dale Scott now has -2 points in Crew Division (-4 Previous + 2 Correct Call = -2). These are the 67th and 68th ejections of the 2015 MLB Regular Season. This is the 33rd player ejection of 2015. Prior to ejection, Kemp was 0-2 (SO) in the contest. This is the 29th Manager ejection of 2015. This is the Padres' 6/7th ejection of 2015, 1st in the NL West (SD 7; LAD 5; COL 3; SF 1; ARI 0). This is Matt Kemp's 2nd ejection of 2015, first since April 25 (Marty Foster; QOC = Y [Balls/Strikes]). This is Bud Black's 3rd ejection of 2015, first since April 19 (James Hoye; QOC = Y [Balls/Strikes]). This is Dan Iassogna's first ejection since March 12, 2015 (Fredi Gonzalez; QOC = Y [Balls/Strikes]).